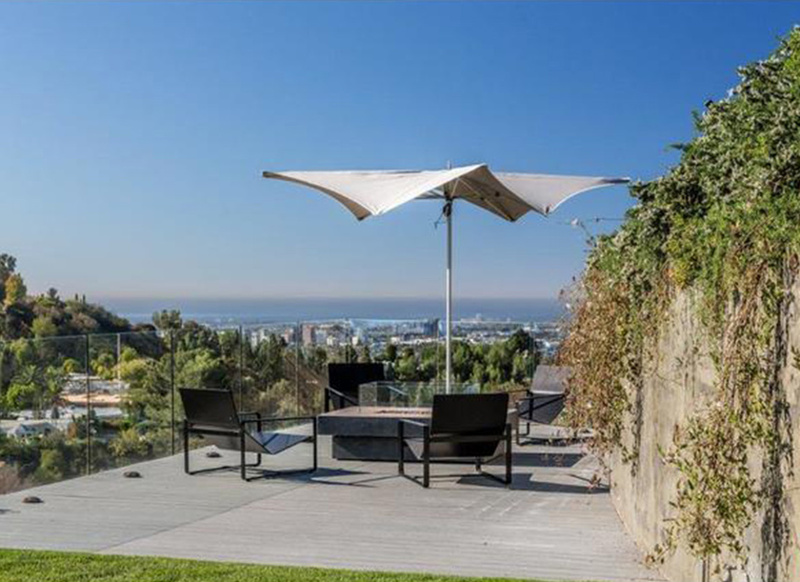 Like many a modern mansion in L.A., this one has celeb history but no architectural pedigree. 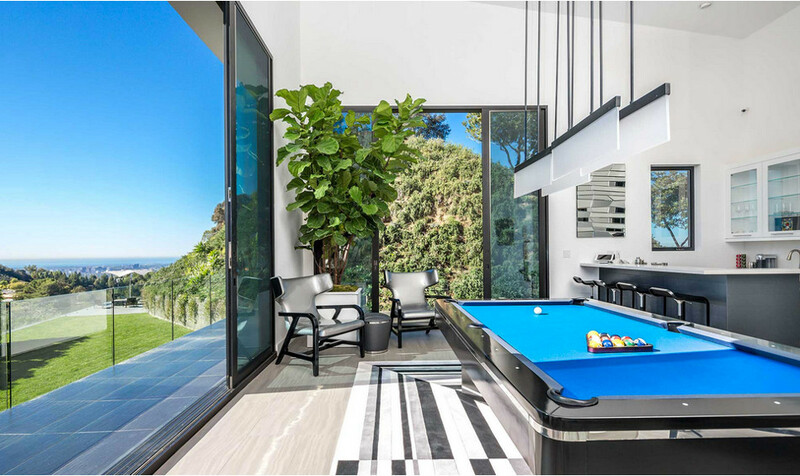 Mainstream designers bemoaning the enthusiasm for modern and mid-century design need look no further than this modern mansion in Beverly Hills. In a way, it’s emblematic of the visually streamlined 21st century house style. And it was just bought by those adorable food crazy kids, John Legend and Chrissy Teigen, whose kitchens I wrote about here in November. 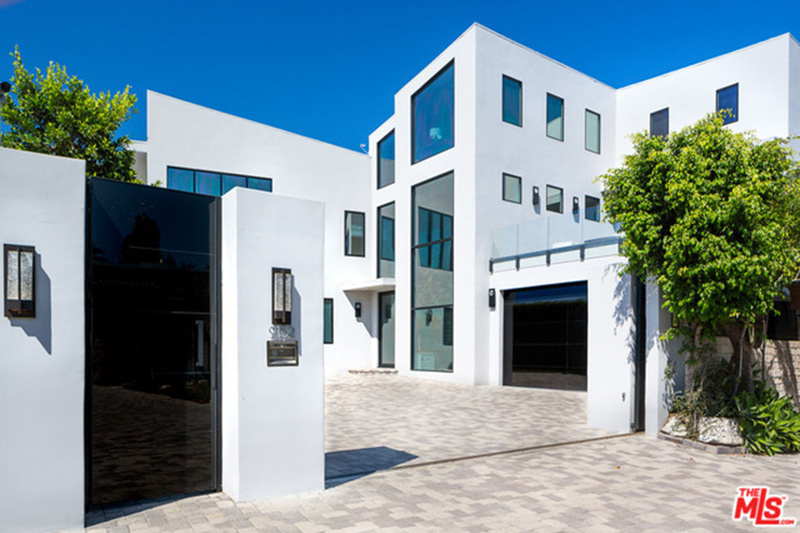 Like many a modern mansion in L.A., this one has celeb history. 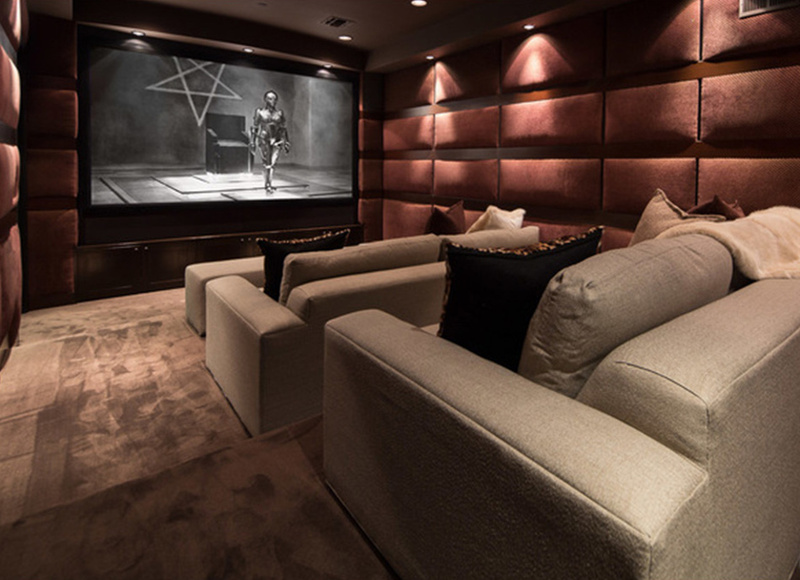 A few years ago the house belonged to the singer Rihanna, who sold it at a loss complaining of leaks. It was then renovated as well as redecorated by Kirk Nix of KNA Design of Las Vegas hotel fame and flipped for north of $12 million to the Legends, who are famously pregnant right now. Many of these big Beverly Hills houses are not on huge plots of land. This one sits on less than an acre and has no architectural pedigree. It qualifies as a mansion — at least by my definition — because it’s larger than 7000 square feet. Charting in at 8520 square feet (according to Trulia) it has 5 bedrooms and 8 bathrooms. 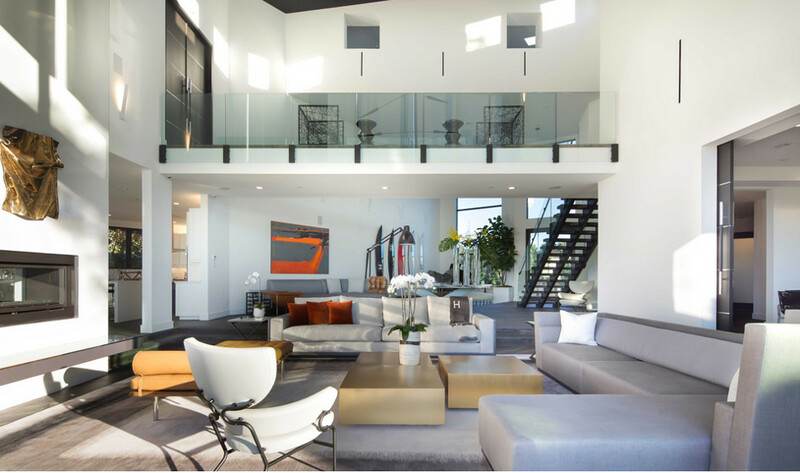 In addition to square footage, the major appeal of a modern mansion is expansive room size, large windows, indoor-outdoor views of landscape and open sky, clean lines and neutral architectural features. Modern style houses are easy to understand visually because the style is integral and non specific. 1. Super high end kitchen. Per a photo snapchatted by Chrissy Teigen which my associate Lisa saw this week, this kitchen is already being gutted! Smart move. This layout is cumbersome and a refrigerator next to ovens is flat out bad design. There’s just a cooktop, not a high-powered range. The fridge looks undersized for the needs of a big house let alone two foodies who both love to cook. 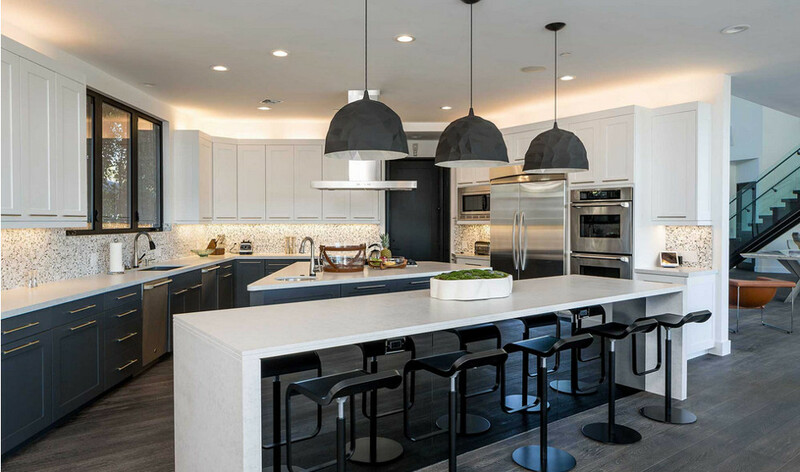 Current requirements for a super-high-end kitchen can include a convection steam oven, high-output stove, built in refrigeration and a kitchen with more personality vs one that already looks generic if not dated. Thermador appliances are not sufficiently luxe — it will be interesting to see the transformation. 2. Master Bath Steam Shower. I’m betting the Legends have plans to gut and redo the master bath. While it does have the requisite steam shower, the silver and black scheme in this bath is so commercial and, like the kitchen, a little dated looking. With so much tile on the planet, a $12+ million house gets this? 3. Elite location with great views. Located on a cul-de-sac, and perched on a hill in the Beverly Crest neighborhood, the house’s location is tip top. 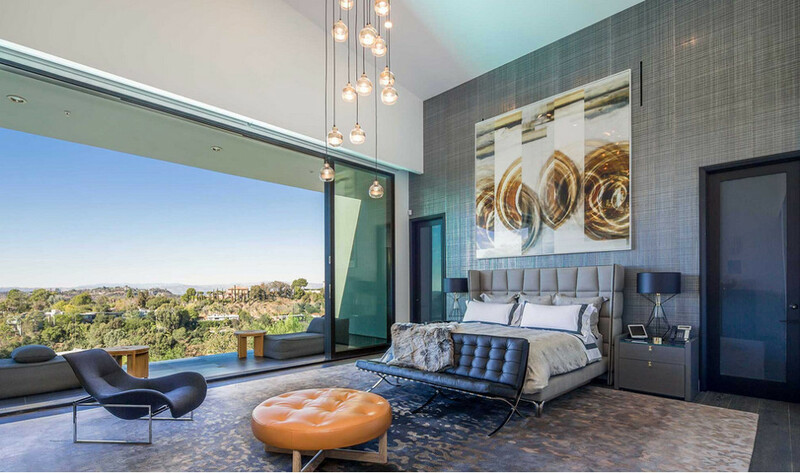 Romantic views from the master bedroom overlook the city. A fire pit at the end of deck offers spectacular views and an instagram-worthy spot for entertaining. This also would be a great spot for an outdoor pizza oven built up against that retaining wall. 4. Game Room. Even the current billard room comes with a view. This could easily be converted to a family room or a card room, of course. 5. Screening Room. This is not a home theater. It is a professional grade private screening room. Screenings are a way of life for the Hollywood elite. So many great films and you know the person in the next seat. 6. Gas Fireplaces. 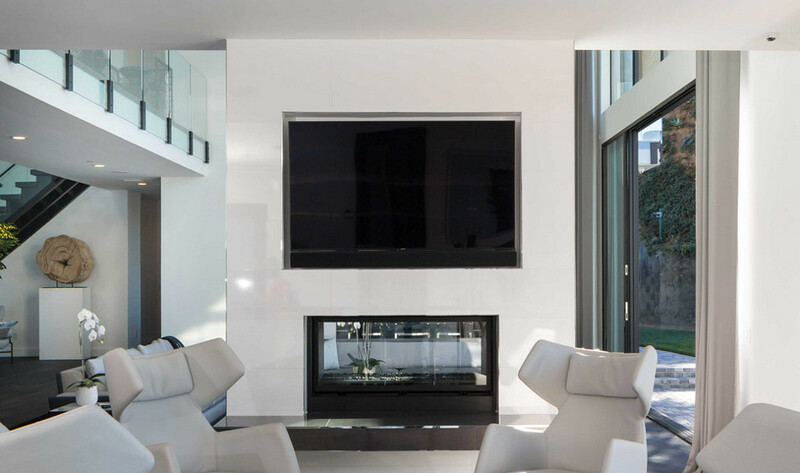 Whether double-sided or linear, gas fireplaces add both real and perceived warmth to a modern mansion where there tends to be very little warm dark wood. 7. In-Wall Flat Screen TVs. I am an avowed flat-screen aficionado. I want one in every room and the bigger and tech-ier the better. These are big, I’ll give them that. And if they aren’t hi-def it’s easy to switch them out. Additionally, this house has a wonderful linear fireplace in the master bedroom. 8. Marble in the Closet. I’ve done several posts on Hollywood closets. Models and entertainers need them and this one (I’m presuming it belongs to the master bedroom) isn’t a disappointment. 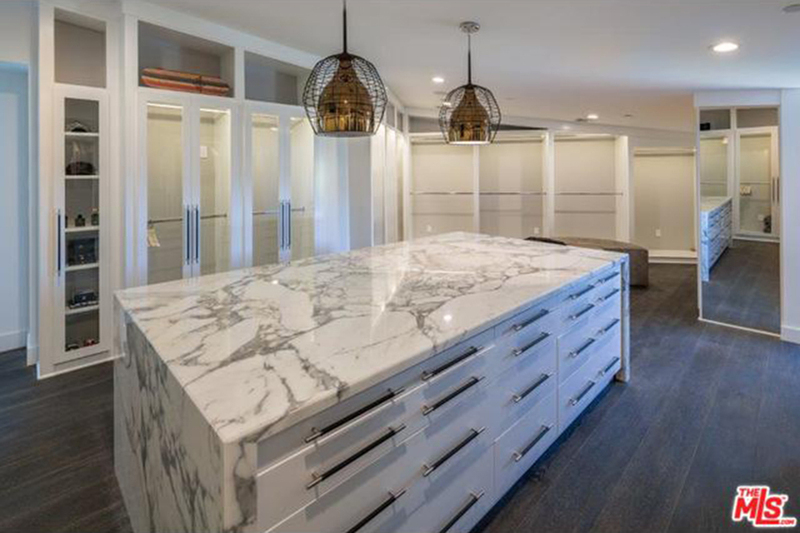 In addition to being huge and having specialty built in, it as a marble-topped island — a premier feature for his or her. Having spent some of my teenage years in Beverly Hills and as the daughter of a BH real estate broker, it’s been amusing to see how times have changed the outlook on home styles in L.A. But one thing always stays the same: you are where you live. Which is why a modern mansion can even be a starter house for a young Hollywood couple today.